Industrial wireless sensor networks (IWSN) are a key enabling technology in allowing for a more autonomous industrial sensing, monitoring, and process automation environment; eliminating the need for specially designed industrial cabling for harsh environments. Early IWSN standards based in the IEEE 802.15.4 protocol such as WirelessHART (2007) and ISA100.11a (2009) guarantee a level of quality of service (QoS) with mesh networking and channel hopping over a 100m to 200m range. The newly emerging Low Power Wide Area Network (LPWAN) fills a unique niche of connectivity that requires long battery life over a long range. LPWAN technology boasts a battery life of 5+ years per node with link distances that can range from 2 km to 3km. While WirelessHART and ISA100.11a are best used for low-latency time sensitive applications such as non-critical monitoring, alerting, and supervisory control applications below 100 ms, LPWAN technology can best serve automated meter reading, home/building automation, wireless alarm and security systems, irrigation systems, and other long range applications that do not require latency to be deterministic. In the long run, Industrial connected wireless sensing, tracking, and control devices will approach 500 million in 2025 (from 35 million in 2017) where LPWAN technology including LoRa, Sigfox, LTE-M1, and NB-IoT will account for 25% of the connections by this time . LPWAN variants such as Sigfox and NB-IoT leverage ultra-narrowband (UNB) technology, allowing for a lower transmit power with a high range as well as a high receiver sensitivity by effectively lessening its noise floor. As made evident in Table 1, this comes at the cost of packet size and throughput since there is not as much available bandwidth to transmit large amounts of information. 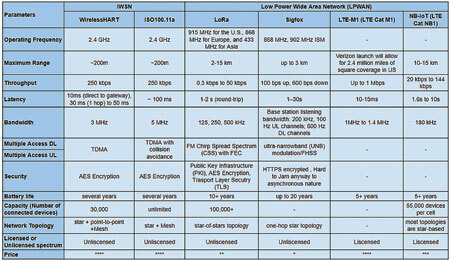 Table 1 • Overview of IWSNs and LPWANs. The wideband, high data rate LTE-M1 (also known as LTE Cat M1) offers up to 1.4 MHz of bandwidth but is a licensed technology whereas LoRa’s open source networking platform enables a rich developer community for universities and startups to innovate. For instance, the University of Washington recently developed a wide-area backscatter system that can successfully achieve link distances of up to 2.8 km with a backscatter IC that costs ‘less than a dime’ consuming 9.25 µW of power with commodity LoRa hardware . CableLabs has also created an open source LoRa server, LoRa App Server, and LoRa gateway bridge with a documentation and code repository in an effort to focus on open innovation as opposed to proprietary LPWAN solutions . LoRa technology seems to be the primary contender in the LPWAN race for both public and private (industrial and enterprise) networks, this is due to the fact that it has enough bandwidth for most factory applications. According to ON World, LoRaWAN networks are currently deployed in 50+ countries and there is predicted to be nearly 500,000 LoRa networks installed worldwide by 2022. LoRa is short for “Long Range” and requires end-devices that consume extremely low powers on the order of 10 to 25 mW. The physical (PHY) layer leverages a FM chirp spread spectrum (CSS) radio modulation technique with forward error correction (FEC) and a medium access control (MAC) layer with the LoRa wide-area-network (LoRaWAN) protocol. While the network can transmit and receive at many frequencies between 150 MHz and 1 GHz, LoRa technology operates in the 915-MHz band in the United States, the 868-MHz band in Europe, and the 433-MHz band in Asia ― all are unlicensed industrial, scientific, and medical (ISM) bands. With a maximum throughput of 50 kbps with channel aggregation, LoRa transceivers from Semtech (e.g. : the SX1272) can operate with three programmable bandwidths: 125 kHz, 250 kHz, and 500 kHz. 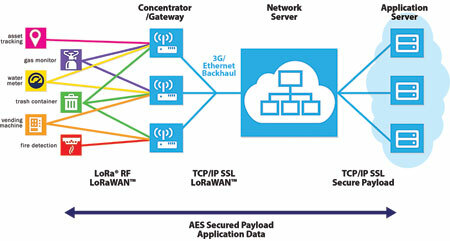 Figure 1 • LoRaWAN network diagram. The spread spectrum in LoRa is established by generating a chirp signal ― a signal where the frequency increases ― that continuously varies in frequency. The benefit of leveraging this is the timing of frequency offsets between the transmitter and receiver are identical thereby limiting the data rate for an increase in receiver sensitivity and ultimately, the range of the LPWAN. Additionally, the spread spectrum inherently has immunity to multipath and fading. The time-on-air or latency can be modified through adjustable parameters include payload size, data rate, error correction coding, range, spreading factor (SF), and bandwidth (BW). Within LoRa, there is a trade-off between the occupied bandwidth (which directly correlates to data rate) and the sensitivity of the receiver as shown in equation below . Where S is the sensitivity of the radio receiver, BW is the receiver bandwidth, NF is the receiver noise figure, SNR is the signal-to-noise ratio. A design engineer leveraging a LoRa transceiver will only have control over the NF and SNR parameters in order to optimize the sensitivity of the receiver. Similarly, there is a trade-off between the SF and the link range; the higher the SF, the longer the range, and the slower the data rate. Since LoRa hardware operates in the unlicensed spectrum, QoS cannot be guaranteed and therefore frequency agility schemes (frequency hopping) are often employed on each transmission to mitigate external interference. Still, this can increase the interference and packet error rate (PER) since one of two scenarios often occur: the transmitter/receiver jumping to an already occupied channel or having another end-device hop to the channel during a target transmission. There are primarily two MAC layer options for LoRa networks: LoRaWAN and Symphony Link. LoRaWAN is a public network protocol managed by the LoRa alliance and is most commonly used in noncommercial applications whereas Symphony link was specifically designed by Link Labs to better fit industrial and enterprise applications. The non-proprietary nature of LoRaWAN has allowed for a more rapid proliferation of this MAC protocol while Symphony link was developed by Link Labs in order to exploit the benefits of the PHY LoRa layer while improving on some of the limitations of LoRaWAN. As shown in Figure 1, the LoRaWAN is typically laid out in the star-of-stars topology where gateways (aka: access point or base station) relay messages between end-devices and the network server. End-devices relay information to the gateway(s) over a single wireless hop. Gateways, in turn, send information via cellular or hardwired Ethernet backhaul to the network server. Finally, the information is processed through an application server that handles subscription and data management (e.g. : firmware upgrades and mobile network operator (MNO) subscription). The application server is typically deployed through the cloud where the messages are encrypted/decrypted. While communication between server and nodes is bidirectional, uplinked data transmissions from the end-device to the gateway is the default option. As shown in Table 2, there are three types of end-device classes: A, B, and C. All three classes can be utilized in the same network and each end-device can switch from one class to another but Class A must be implemented on all end-devices. Both Class B and Class C are compatible with Class A, but Class C devices cannot implement Class B . The LoRaWAN topology takes advantage of the CSS modulation scheme by managing the data rate and RF output for each end device through an adaptive data rate (ADR) scheme . Table 2 • LoRaWAN Classes . Instead of leveraging the cloud heavily ― a parameter that can lead to a security issue for industrial networks ― Symphony Link completes the MAC process on the gateway so that it can deployed as a stand-alone system in a plant without the need for the internet. Moreover, this MAC layer uses repeaters to proxy traffic between nodes and expand the range of the network instead of outdoor gateway access points. There are no device classes since this system uses a synchronous scheme to allow for the higher data reliability and lower latencies that are necessary for IIoT applications. The use of the unlicensed ISM bands can be a double-edged sword since neighboring LoRaWAN networks can cause channel interference where a LoRa modem is decoding all packets in the vicinity ― ultimately negatively impacting the PER of a system. Symphony Link is partnered with licensed spectrum partners to allow for dedicated spectrum for safety critical industrial applications. LoRaWAN-based networks have shown success in periodic messaging applications where there is a certain threshold of delay between message transmissions. For instance, in smart street lighting applications, lighting elements are triggered for ON/OFF switching or dimming functions in events such as a sunrise or sunset ― events that are widely spaced out in time. Figure 3 • Symphony Link network diagram . The duty cycle, or maximum percent of time an end-device can occupy a channel, can also be a major limitation in LoRaWAN technologies. While the FCC does not provide a duty cycle limitation for the United States 915-MHz ISM band, the European Commission mandates a maximum of 1% for end-devices in the 868-MHz band. Symphony Link does not have duty cycle limitations and uses proprietary frequency agility schemes to optimize data rates and time-on-air. The architecture is more streamlined as the complicated key management that comes with hundreds of thousands of devices is handled. The protocol also comes with a dynamic data rate where parameters such as transmit power and spreading factor are constantly adjusted to fit the network needs. Furthermore, Symphony Link allows for firmware over-the-air upgrades can be performed on end-devices where LoRaWAN does not enable that function. 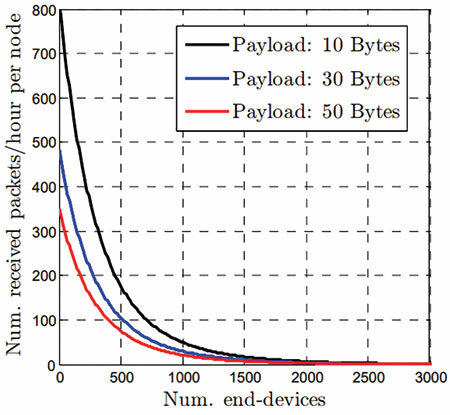 As shown in Figure 4, as the channel load increases to full capacity in a LoRaWAN-based system, the collision rate increases significantly to the point where 20% to 30% of messages can be lost in a network that transmitting a few hundred messages a minute . While this may be enough for systems transmitting a relatively small amount of messages in large gaps of time, it may not suffice for the ‘data reliability’ factor craved by IWSN users. Figure 4 • Graph illustrating impact of an increase in channel capacity with the number of packets received per hour when end-devices attempt to transmit . Furthermore, the completely asynchronous nature of LoRaWAN makes it so that anytime a gateway is transmitting information down to nodes, it is not listening and is therefore losing traffic. The synchronous and slotted Symphony Link protocol allows for a level of QoS assurance by suppressing unimportant traffic and allowing more critical traffic through to the gateway. The network is safeguarded through Public key infrastructure (PKI), real-time advanced encryption standard (AES), and transport level security (TLS). Since the architecture is stand-alone proprietary system there is inherently simpler data access. Besides, the lower latency (100ms to 120s) and higher data rate (1 kbps) allows for quicker data throughput and transmission times also easing data access. A recent survey by Accenture revealed that 80% of oil and gas (O&G) companies expect to continue to invest in digital technologies over the next 3 to 5 years despite the current low oil price environment . Flow rate and pipe pressure sensors can be installed on O&G equipment such as oil pipelines reducing the risk of leaks and ruptures to avoid some potentially catastrophic environmental consequences. With nearly 2.5 million miles of pipeline in the U.S., the combination of long range and data reliability that LoRa offers can provide a solution. 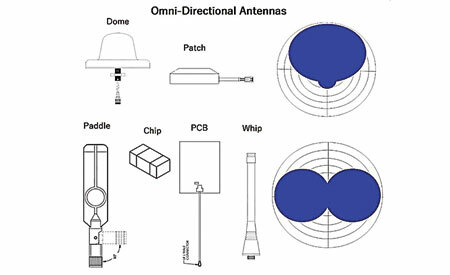 Figure 5 • Omni-directional antennas that are often used in LoRa modules with basic 2D illustration of radiation pattern . Plant-wide networking where it may be necessary to track tens of thousands of assets with parameters such as location, temperature, humidity, and vibration requires a long link range, data reliability, and a high network capacity. While the most common IWSN WirelessHART can connect up to 30,000 devices within a 200 meter range, LoRa with the Symphony Link MAC can control up to 250,000 endpoints up to 11 kilometers . There is a myriad of potential LPWAN applications for IIoT, all require a level of customization for parameters such as placement of the nodes, transceiver selection, sensor/actuator type, energy storage and power management, and finally antenna type. The choice of antenna depends upon the requirements such as harsh environmental exposure, space requirements, budget, necessary range, and polarization. Three key parameters in understanding the antennas that are used in LoRa and other LPWANs are as follows: directivity, gain, and VSWR. Directivity is a measure of the concentration of a beam from the radiating element. For instance, a horn antenna has a very high directivity as compared to an Omni-directional patch antenna. Gain is a measure of the total power radiated from the antenna. An engineer assessing any antenna would have a pretty good idea of what their looking at just by analyzing the gain along with the antenna polar diagram ― the graphic representation of the radiation pattern. VSWR, or voltage standing wave ratio, describes the power reflected back from an antenna. Theoretically, a perfectly matched (50 ohm) antenna would have a VSWR of 1:1 and reflect no power with all the inputted energy radiated into free space. 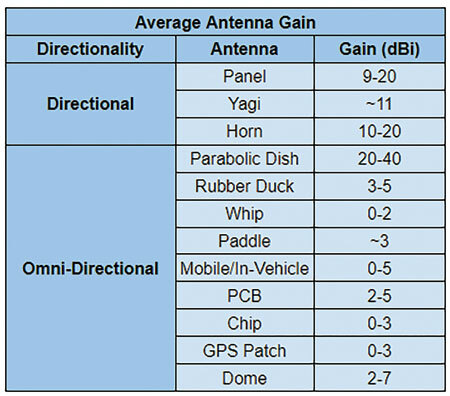 Table 1 overviews the average gain of some commonly used commercial off-the-shelf (COTS) antennas. Table 4 • Length of Wire Antenna Per LoRa Frequency Band. Where PR is the power received by the antenna, PT is the power transmitted power, GT is the gain of the transmitting antenna, GR is the gain of the receiving antenna, c is the speed of the light, R is the range between the antennas, and f is the operating frequency. For instance, the Semtech SX1272 transceiver uses MMIC HPAs to offer +20 dBm of power output and the LoRa modulation technique can bring the receiver sensitivity to -137 dBm. Furthermore, the sub-GHz transmit frequencies inherently have longer wavelengths to maximize range as well. Both LoRa end-devices and gateways typically employ Omni-directional rubber duck antennas with gains as high at 5 dBi. Omni-directional onboard antenna variants such as PCB or chip antennas can also be leveraged so as to save space on the module; experimentation from hobbyists have yielded ranges up to 9 km . Typically, rubber duck antennas are generally the most expensive, have the highest gain, and exhibit the most uniform radiation in all directions. PCB antennas typically have a lower gain but can be implemented in a package, still, they can be quite large at low frequencies. Chip antennas normally exhibit the least gain and, while they are technically Omni-directional, may have a level of directionality where the chip needs to be pointed in a certain direction in order to maximize range. The cheapest solution is the wire antenna where many hobbyists simply cut wire based on the operating wavelength and solder it onto the U.FL connector head, naturally, this is not a long-term solution although it may suffice for the prototyping stage. Table 3 lists the length of the cut needed per frequency band. The rubber duck (whip), chip, PCB, and wire antennas are all linearly polarized and will need to be installed so that the polarization is in the same direction in order to function. LoRa modules that employ GPS tracking need omnidirectional circularly polarized antennas such as coil (helical) and patch antennas where there is maximum radiation pattern in a certain direction. Ultimately, the high sensitivity of the receiver affects the link budget where the gain of the antenna is of lesser consequence. Moreover, most antennas can handle the maximum rated +20 dBm of continuous power from LoRa transceivers so the main limiting factors are the environmental conditions, space, and budget. Outdoor applications will often need IP67 or above rated antenna/connectors (if using an external antenna) in order to ensure long-term functionality of the node. Whereas, space constrained node placements may need to leverage an onboard antenna such as a PCB or chip antenna. LPWANs serve a unique niche of wireless connectivity that high throughput, WiFi and cellular applications cannot quite match. Not every application needs to stream 4K videos and, in the instances where small amounts of data in the form of updates are needed, LPWANs are the answer. While the LTE-M1 LPWAN will now be deployed where current Verizon 4G networks are (practically everywhere in the U.S.), it is a licensed network and therefore has higher associated costs; this is also not necessary for stand-alone IWSNs. The unlicensed LoRa network has a budding open source community where innovation is constantly occurring (and where base stations are being put online), allowing for this option to not only be ideal of consumer applications but also giving it tremendous potential in industrial applications. The fact that the LoRa modulation technique is not UNB actually allows for a fair amount of throughput (~ 1 kbps) as compared to other LPWANs, making it a more practical option for IIoT applications. The plethora of LoRa chipsets allow for a level of customization for endpoints that is well-documented in the open source community, still, the choice of antenna may not be as highlighted and can therefore be a pain point in LoRa deployments. Mark Miller serves as a Product Manager for L-com Global Connectivity. F. Adelantado, X. Vilajosana, P. Tuset-Peiro, B. Martinez, J. Melia-Segui and T. Watteyne, "Understanding the Limits of LoRaWAN," in IEEE Communications Magazine, vol. 55, no. 9, pp. 34-40, 2017.